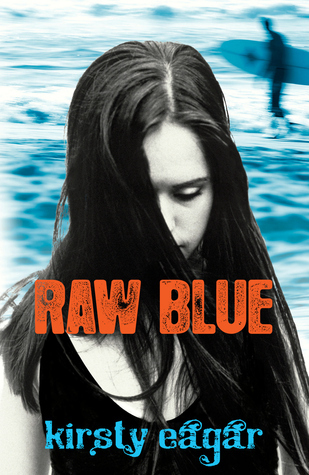 Raw Blue by Kirsty Eagar is the kind of book you read and immediately want everyone else in the world to know about. I think “raw” really is one of the best ways to describe the book, great title choice. It doesn’t take long for you to feel attached to Carly, the main character. Kirsty Eagar doesn’t pull any punches, she makes it very easy to see the world through Carly’s – very emotionally damaged – eyes. I’m telling you, ALL of you, this is one of those books you just have to read! It is my favorite kind of young adult novel: the characters are old enough to be out of high school but young enough not to have their lives together. Carly definitely doesn’t have it together – she buries herself behind a wall of OCD and surfing to hide from the fact that she was raped. As the book progresses, we see her interactions at work (as a chef-sort-of) and on the waves. As her hard-won mask starts to crack, she finally lets a few people into her life. I am being deliberately vague about the plot because I want everyone to read this book, and I want you all to have fresh eyes for the experience. As far as the many surfing runs and related lingo goes, I was fascinated by it. Kirsty Eagar left it pretty basic and easy to follow. I mean, I’m from Oklahoma y’all. What I know about surfing could balance on the head of a needle, but I was able to easily keep up with it and understand. I really enjoyed all of Carly’s interactions both with the waves and other surfers. Those scenes highlighted her awkwardness and not-so-well-buried-anxiety very well. Carly really is a very complex character. She isn’t the kind of character readers normally fall for – she makes a lot of mistakes and has a lot of issues. But at the same time, you can see almost from the first page that there are two sides to her personality. And let me tell you now, you will read this book holding your breath – just hoping – to see a glimpse of the actual Carly. I really feel like she is one of the best written characters I’ve come across. I also loved the writing – it was very off-beat and quirky. The descriptions especially: very charming and unique. So, hopefully I’ve convinced you by now that you have got to pick up a copy of this book! It isn’t actually available in the United States except as an ebook. I promise you guys, it is worth the little bit of extra trouble to track down. Really great and original book. It’ll be standing out in my memory for a long time. I thought is was fabulous as well and second your recommendation! This review is AH-MAY-ZING!!! And completely correct! You know I'm linking this up on my page 🙂 PS – if you do know of any blogger who might reading and reviewing this soon, let me know. . . Fabulous review and welcome to Team Carly! Yay! So pleased you loved it. This book deserves widespread attention as it is so refreshingly well done. Love Carly and Ryan! Crunch happiness. That sounds so odd, but I get it. There aren't many YA novels where the characters are out of high school. It's refreshing. Love the review. I really want this book. Oh, I love this book SOO much, it's just amazing! And yes, Danny and Ryan are both awesome 🙂 Great review!